Update 12/3/12: Classics at Station 361 announced last week that Phase I featuring 29 beautifully-appointed homes is sold out. With sales starting at the end of June, the sales absorption rate was just under 1.5 homes per week. Homebuyers started moving into their new homes in September, so Classics at Station 361 is starting to look like a neighborhood with residents enjoying the community amenities. Look for announcements regarding Phase 2 in the New Year. The 36 homes in Phase 2 are sure to be as popular with homebuyers as Phase 1. Be sure not to miss this great opportunity to own a new home close to downtown Mountain View. Contact Alex H. Wang if you'd like more information and/or to set-up and showing. Lane Woods, by builder Summerhill Homes, is opening a new community of 32 residences in Menlo Park targeting the active, outdoorsy family of four. 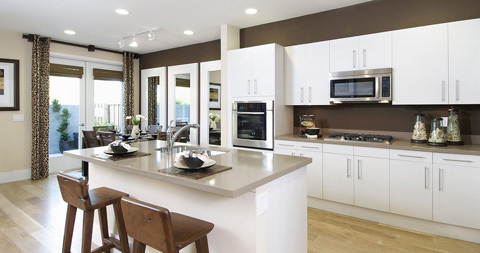 The model homes will be opening for tours in mid-April and move in will be mid-to-late summer. There have already been many inquiries into this community, with the majority of the curious home-buyers being families with small children and babies. The Lane Woods development takes its name from the Lane Family, a family of publishers dating back to the 1920s; The Lane Family put their heritage on the map with the popular Sunset Magazine. Within this beautiful community will be the 2008 Sunset Magazine "Idea House", where the concept is to build a home with exciting new ideas and smart products in mind. The very first idea house was built in Menlo Park in 1998, and for the 10 year anniversary of this project they are returning to the roots where the idea emerged. Each year since 1998, Sunset Magazine has partnered with local builders and architects to create innovative, futuristic, high-end homes with the vision of being ecologically and environmentally conscious. These "?idea houses' have come a long way over the past 10 years, using green standards, being eco-friendly and energy efficient. Another feature of the idea house is the harmonious way that the home transitions from the interior to the exterior and incorporates the natural beauty of its surroundings. Not all the houses will be an idea home, just one: Residence 6 - an astonishing 4 bedroom, 2.5 bath home with nearly 3,000 feet of living space. There are a total of 6 floor plans in the community to choose from, varying from a 3 bedroom, 2.5 bath to 4 bedrooms and 2.5 baths; all homes have a 2-car garage and many options and upgrades. 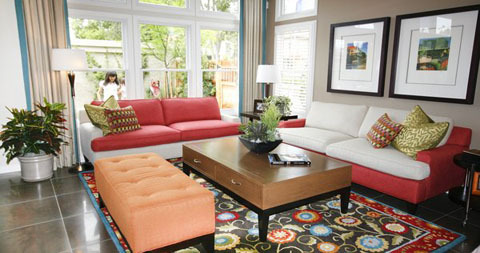 The interior living spaces are generous, sized between 1,750 and 3,000 square feet. The exterior yards are decent-sized and provide plenty of privacy. Each home has a porch and patios that encourage indoor / outdoor living and entertaining. Some of the many standard features include clad wood windows, granite slab countertops, stainless steel appliances; the amenities are endless. Sunset's original courtyard has become the neighborhood park that is easily within strolling distance. Because of the desirable location, pricing for these single family homes will be between $1.5 Million and $2.5 Million. The location of Lane Woods in close by Sunset Publishing Corporation headquarters located at 80 Willow Road in Menlo Park. A big bonus for these homes is the private road where they are located. A lot of the new developments today are being built next to freeways and busy intersections; however Lane Woods is located in a private circle that gets very little traffic. Menlo Park is a safe and prestigious place to live and it is conveniently located midway between San Francisco and San Jose ; access to highways 101, 280, and CalTrain is easy. 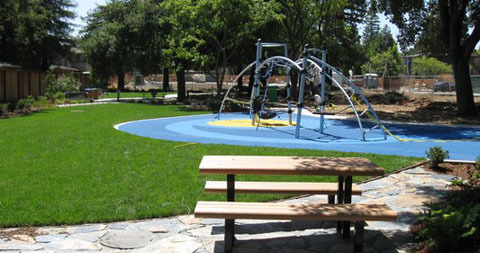 It is also within walking-distance to the neighborhood park and the charming downtown Menlo Park . Using the Waverley Footbridge, Lane Woods residents will be able to walk to Palo Alto's Johnson Park in five minutes, and downtown Palo Alto in ten minutes. Also, within easy distance are Standford University, Stanford shopping center, restaurants, groceries and major places of employment. The highly-regarded schools of Menlo Park are a great aspect considering these homes are being targeted towards families with school age children. Laurel & Encinal Elementary School are the two primary elementary schools; K-2 children with attend Laurel, and grade 3-5 will go to Encinal. Hillview Middle School and Menlo Atherton High will complete their grade school education. With all the great features and amenities that these homes encompass it my best guess to say that with the low inventory of only 32 homes, that these won't be available for very long.